Occupying the third floor of a former shoe factory, this elegant three-bedroom apartment is a wonderfully refined design. Extending to around 2,850 sq ft, an exemplary exercise in light, craftmanship and materials. The main living space is arranged in a sweeping open-plan, flooded with light from large original Crittall windows and glazing across four aspects. Soft green plaster walls echo verdant views across Calvert Avenue to the treetops and square of St Leonard's Church. Each architectural element and detail has been designed specifically, from the patterned hand-made Beldi tiled flooring to the bespoke oak joinery and hand-woven green linen shutters. The apartment has recently appeared in a number of publications including The Times LUXX and The New York Times' T Magazine. The property is situated on the corner of Shoreditch High Street and Calvert Avenue. Shoreditch High Street is the nearest station, with services on the London Overground running to Highbury & Islington and Dalston Junction in one direction, and Clapham Junction in the other. Old Street and Liverpool Street Undergrounds are nearby. Pure heaven for chocolate lovers! Handmade chocolates in a vast variety of flavours. If you can't face the crowds at London's bigger museums, head to this place for a quieter and nicer experience. This museum is all about the home throughout the centuries and the café sells delicious cakes too! Very good coffee and bubble tea for the children. 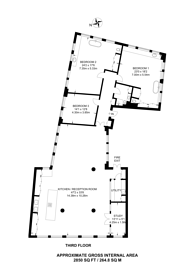 2,850 (264 Sq M) approx.